A summer drive down any major highway will show you that kayaking is growing in popularity as you will find many kayaks strapped to cars and suv's as people head to to their favorite spots. An affordable way to get out on the water and enjoy the summer months, kayak fishing is a great way to get out fishing on open water. X Zone Lures is a must have soft plastic lure for anyone kayak fishing and is producing great results in the south. Although widely used by many of the bass tournament anglers, X Zone Lures is a great soft plastic lure that can be used for anyone that is kayak fishing. Recently, rod builder and Jackson Kayak Pro Robert Brown, armed with his own Osprey Rods and some X Zone Lures, spent some time fishing on Lake Guntersville. Fishing the flats in some overcast weather, Robert caught some nice bass on the X Zone Swammers rigging it on a weighted hook and making some long casts from his kayak. After spawn, bass travel to their summer beds and will feed suspended. By casting the X Zone Lures Swammer, the action is what will create the strike from the bass but you will want to cast it within their sight line. 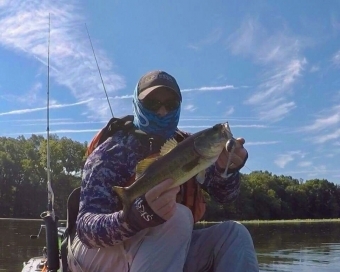 The retrieve will propel the tail into action and the X Zone Lures Swammer has great action and a soft plastic that the bass will want to bite. The innovative rib design of the lure along with the three-dimensional paddle tail with a keel shaped body is an ideal presentation mimicking a baitfish. 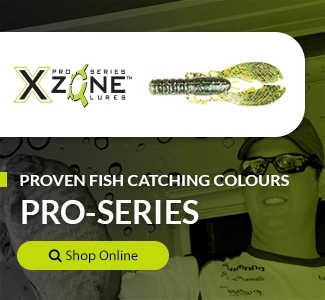 Now available with scent infused and salt impregnation with more colors to choose from, give the X Zone Lures Pro Series Swammer a try the next time you head out kayak fishing.